This week in Seoul Saturday I want to share another awesome and free activity for you while you are in Seoul. 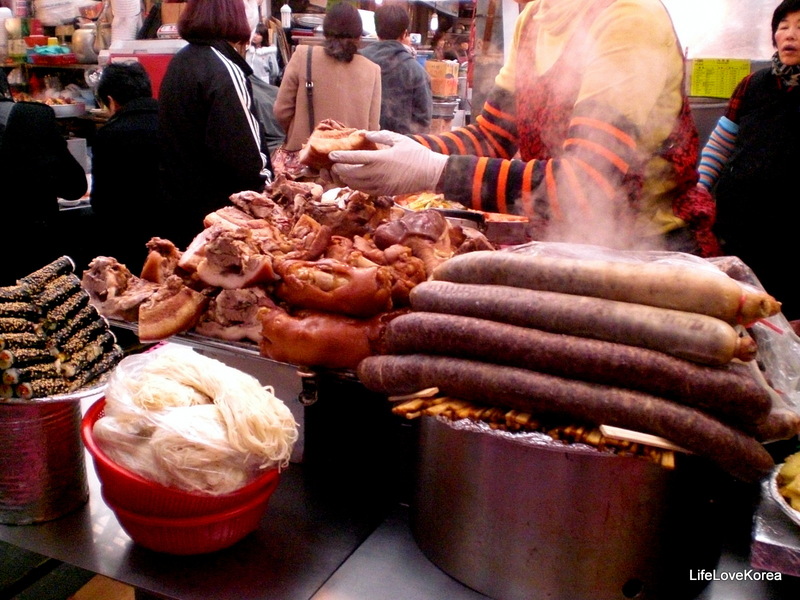 This market is a great place to grab a bit, and don’t worry you don’t have to like pig feet, heads, or intestine to find something delicious over here! They serve kimbab, sundae and the markets famous bindaetteok. 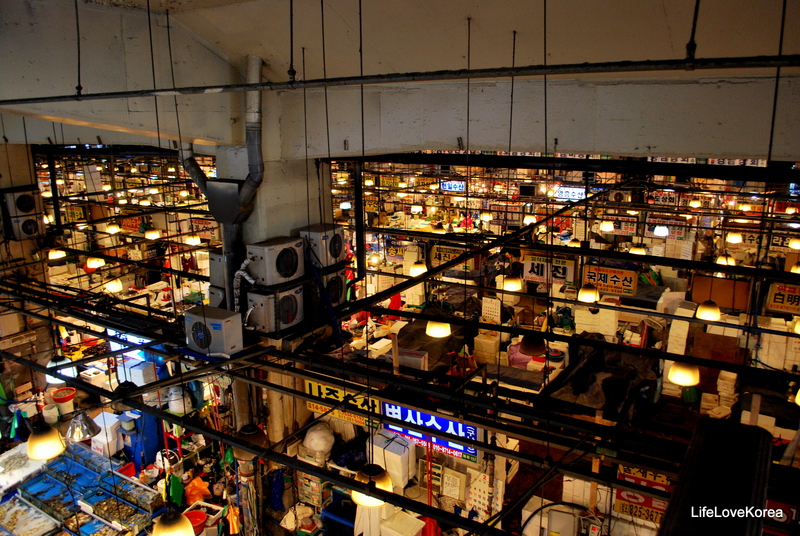 Besides the food, meat and fruits and vegetables stands there is also a good place to buy high quality but cheap fabric. 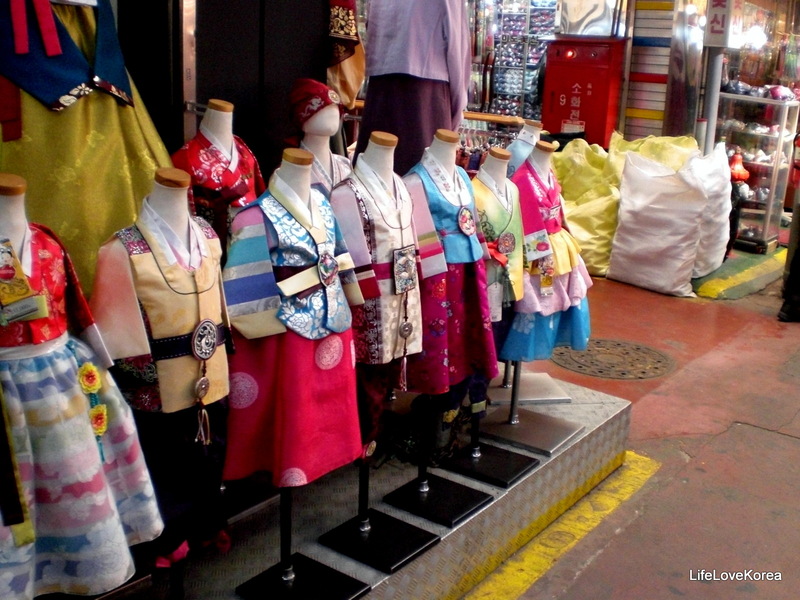 There are many hanbok stores around and stores that sell a bit more of a modern version of the hanbok. 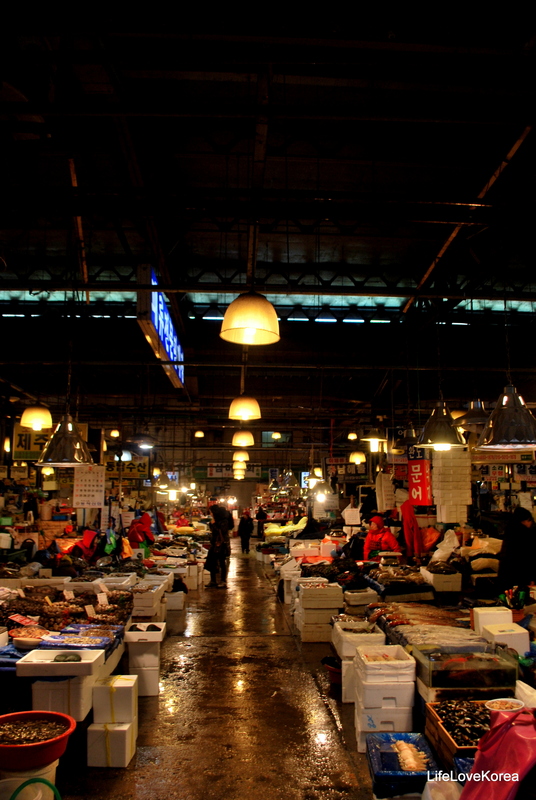 Besides that Gwangjang market is also a great place to find cheap souvenir! 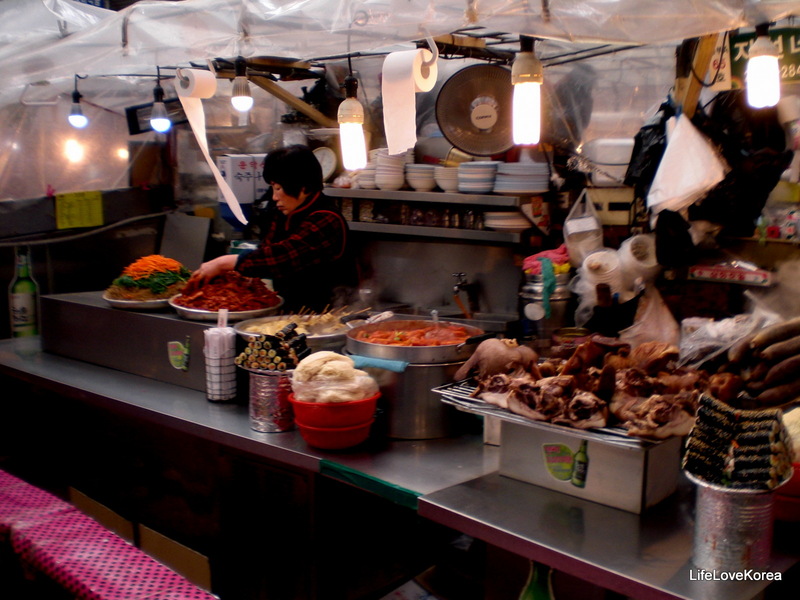 And within walking distance of Dongdaemun where you can do more shopping! How to get there: Take the subway to Jongno-5-ga and take exit number 8. You will basically walk into the market once you exit. 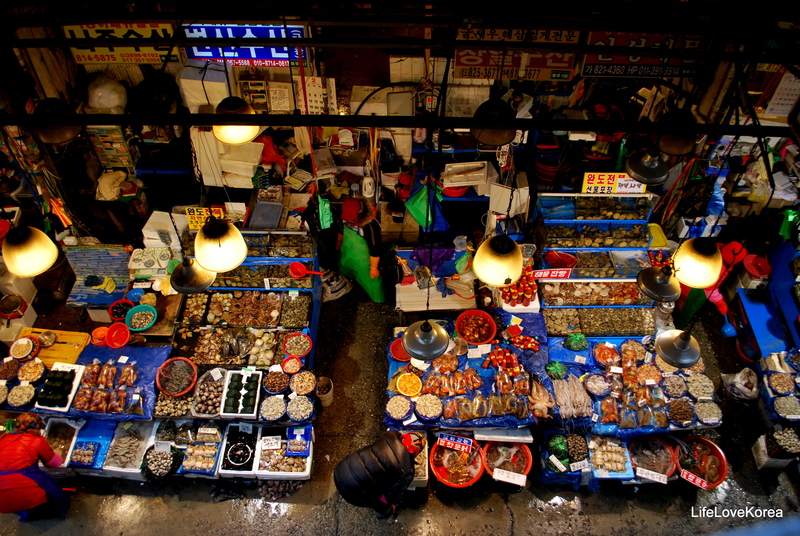 Click here for the official website of Gwangjang market. 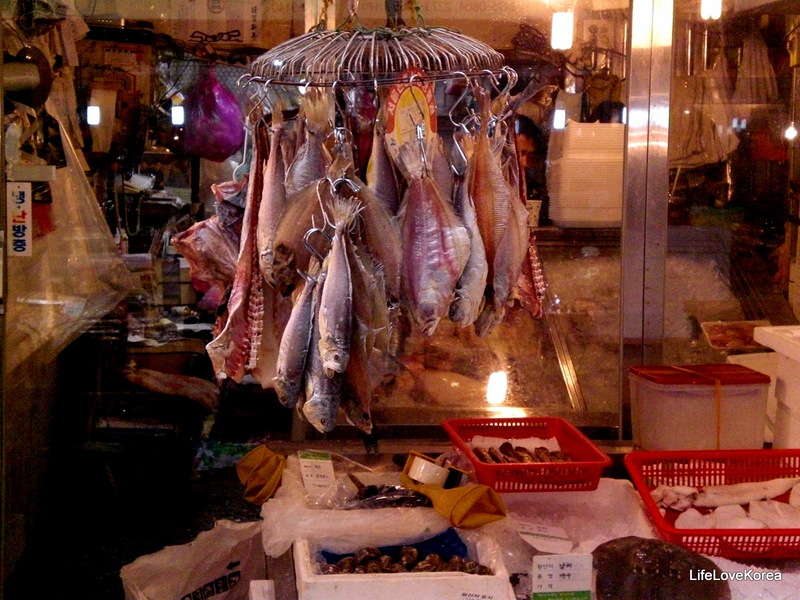 Noranjing Fishmarket, fun – even if you dont’ like Fish! 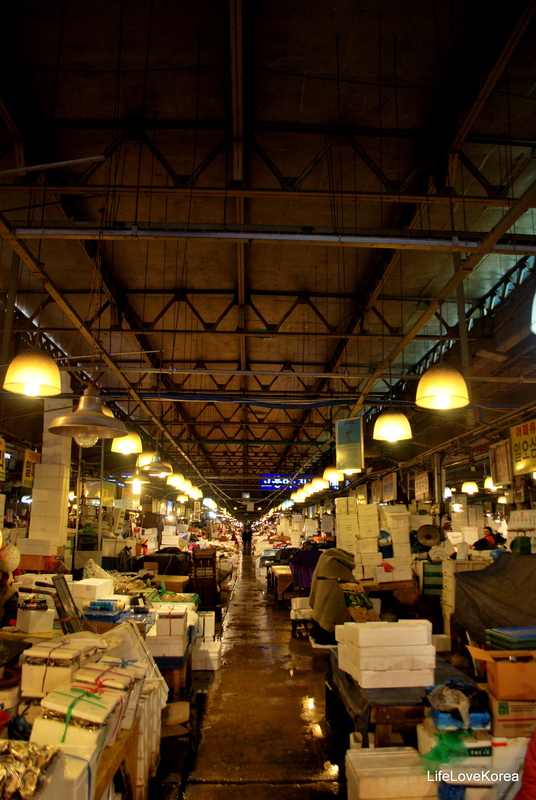 The first time I heard about a fish market I was like well I got to see this, cultural experience and all but I wasn’t really excited for it. Now I still won’t say I will go there every weekend but it is defiantly something you shouldn’t skip on your trip to Korea. Don’t worry, there is no fish smell hanging around and you don’t even have to buy fish to go there. Just walk around and enjoy the atmosphere. Try to figure out if those things are really fish and make plans for a fish liberation campaign. However if you do actually enjoy fish you can pick out your own fish -and see it killed in front of your eyes- and eat it at one of the many restaurants lining the fish market. Although the fish is delicious it can be a bit pricy but it’s a great experience! 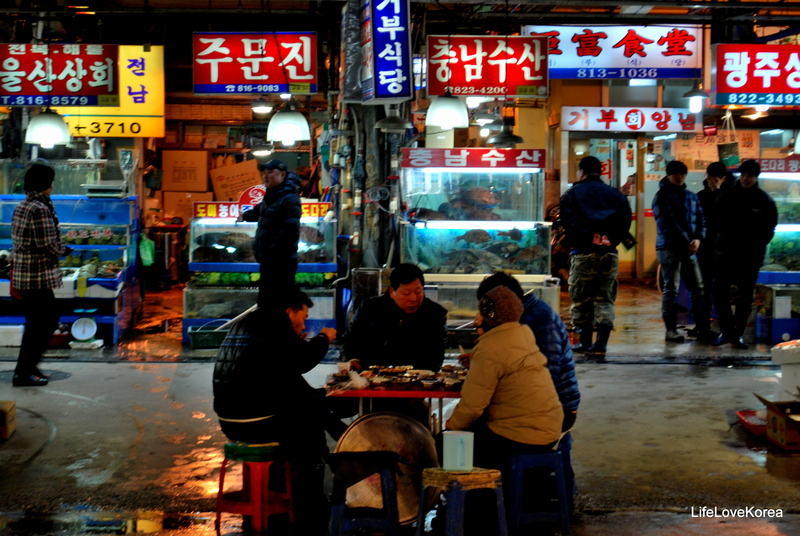 Also if you have been to the fish market in Busan, you should still go norangjing fish market in Seoul. The atmosphere is totally different and there aren’t as many foreigners as in Busan, which makes the experiences even more fun. Directions: Take line one to Norangjin station. Exit at exit 1 and go straight, you will see stairs crossing the road but you have to go upstairs and cross the trainstation. At the end go left and then go downstairs. Cats Living a Cat Heaven. 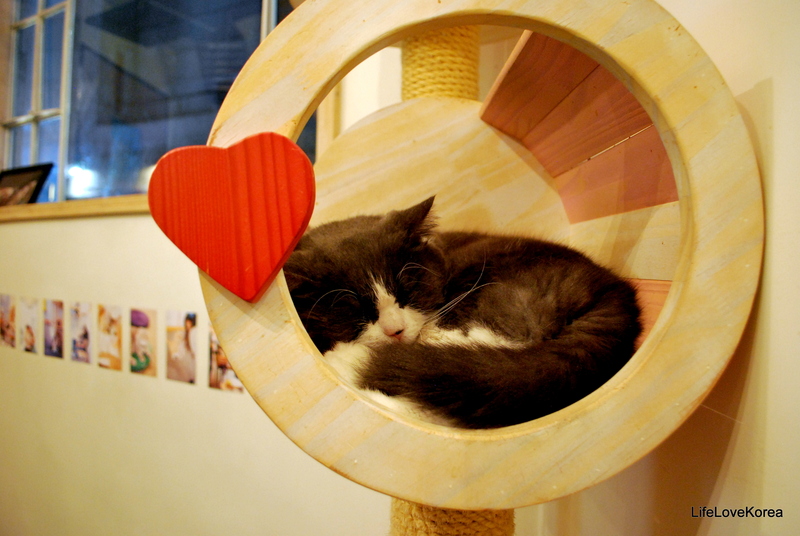 On a cold and windy afternoon my friend decided it would be a great idea to take me and my sisters to a cat cafe. 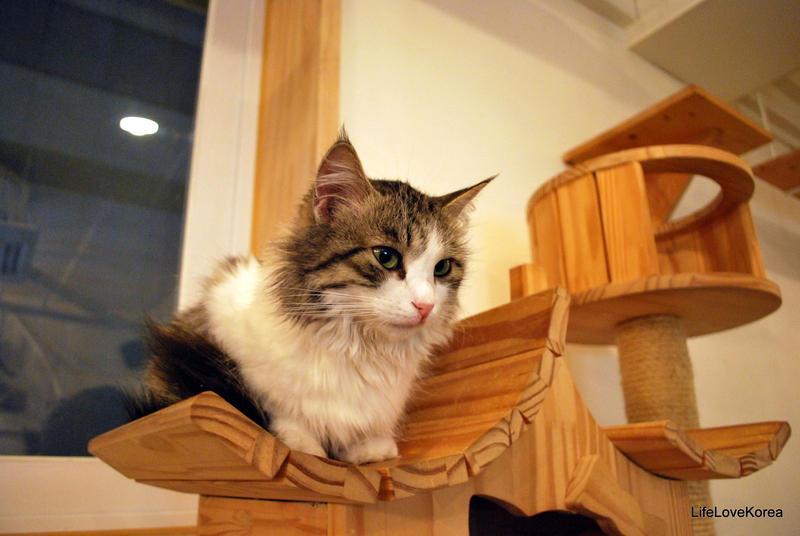 Now I have been all over Seoul and I have done all sorts of things but I had never been to a cat cafe in my life. 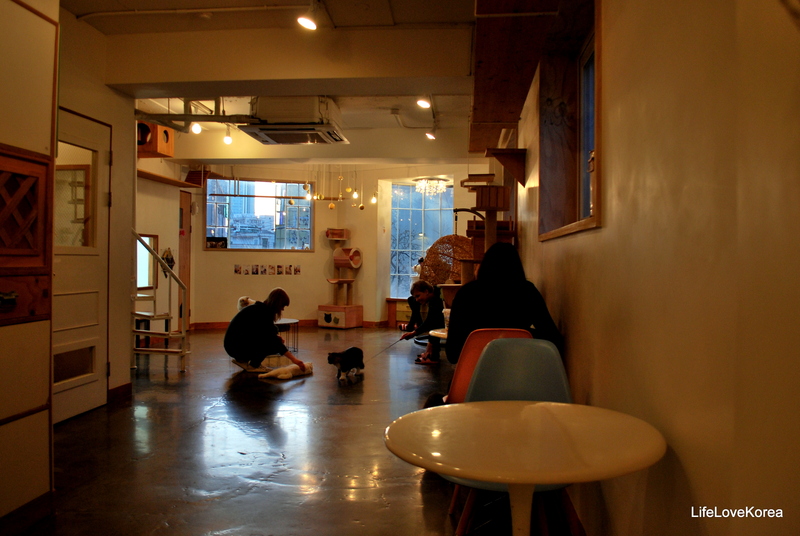 I have been to a dog cafe before but the experience was just so so. And not even because I am allergic for dogs. I just feel that it isn’t good for dogs to be locked inside all day as for cats, their favorite thing to do seems to be sleeping so there is no direct need for them to go outside. 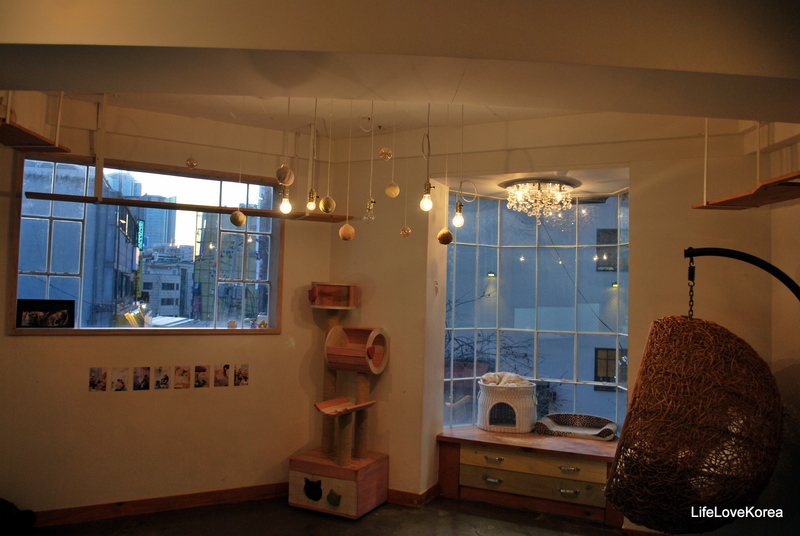 So of we went to cats living – located in Hongdae right next to the Hello Kitty cafe. The moment we stepped inside it felt, clean, nice and cozy. We put away our shoes and jackets in one of the lockers and ordered a drink and then spend a good 2 hours petting and playing with the cats. A great thing was that it wasn’t very busy, unlike the dog cafe where I went. 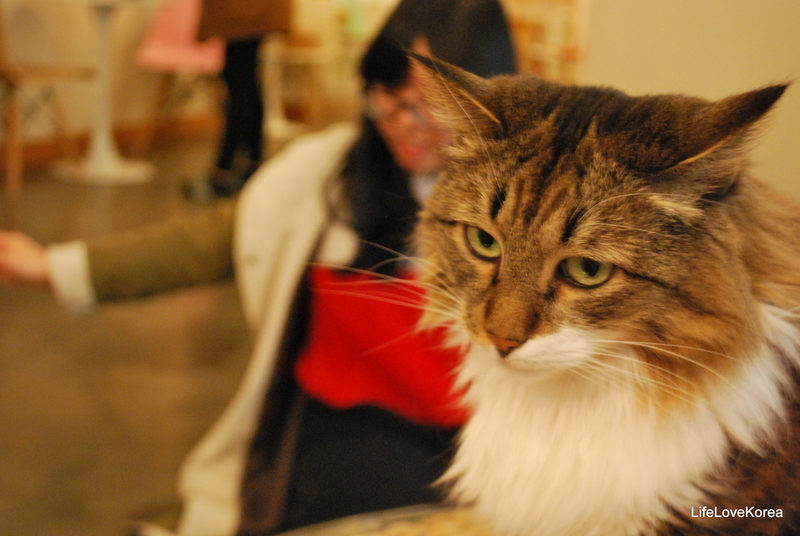 I don’t know if it is because we were there around 7 P.M. or if it is because cat cafes aren’t as popular anymore but I didn’t mind. 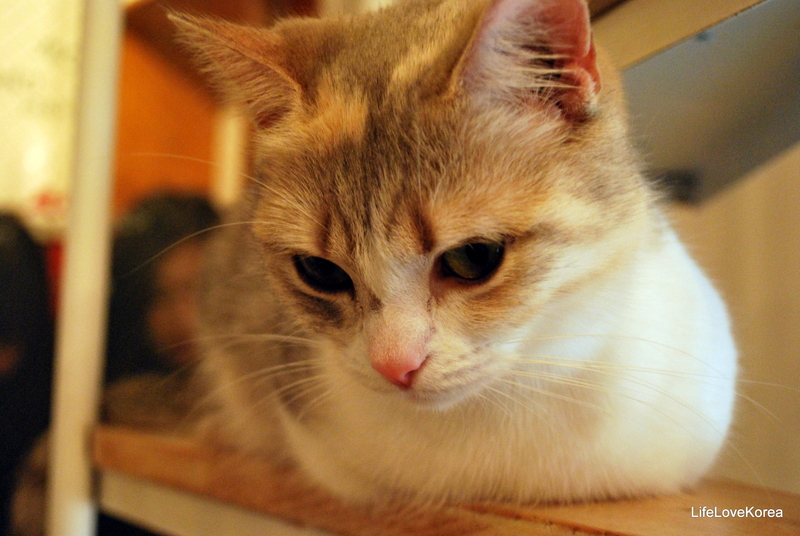 It gave us time to look in every nook and cranny, and discover more cats every minute. Some were just sleeping, some were ready to play and others where a tad bit on the shy side. 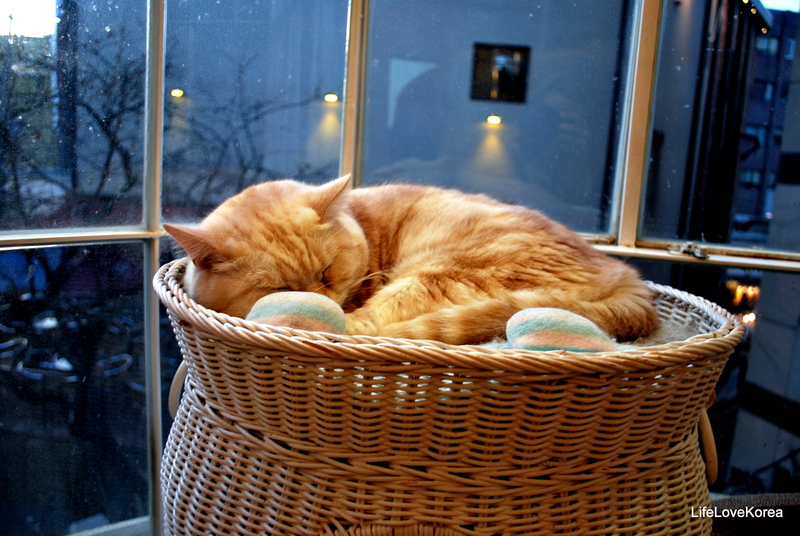 But for everyone there was a cat to like and I really enjoyed my time there. I totally recommend this place, especially on cold winter nights. Either with friends or with your boyfriend, it doesn’t matter. The cats will make you feel loved and at home anyway!